Brick thieves have attacked the house at 1925 St. Louis Avenue in St. Louis Place in recent weeks. Read more about this block here. Yesterday the St. Louis Board of Adjustment revoked the occupancy permit for Unlimited Bricks, a brick yard located at 2600 University Avenue. Police had suspected that the yard has received stolen bricks taken from abandoned buildings in the area, which violates the city’s brick ordinance. Unlimited Bricks conducts business and storage outdoors in a chain-link fenced yard that neighborhood residents describe as unsightly. The Secretary of State’s database lists no registered company or fictitious registration by the name of “Unlimited Bricks.” According to the Assessor, Charles Rosene owns the parcel at 2600 University Avenue as well as large fenced parcels to the north and south where there is open storage of demolition equipment and salvaged materials. 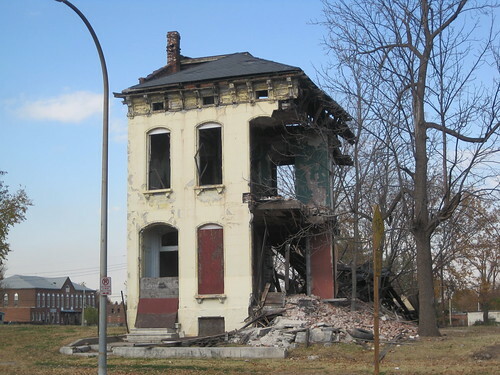 This entry was posted in Brick Theft, North St. Louis, St. Louis Place. Bookmark the permalink. What does this mean for the future of the brick yard and owner? If the company is not registered, does that mean he’s conducting business illegally? Is the city going to attempt to prosecute? If it can be shown that this guy has received stolen bricks, the city should make an example of him. I know… it takes money. The City should require a separate class of business license for scappers and brickyards which are extremely expensive — price increases with the volume of their sales. Most likely they would pass this cost along to the dealers or whoever ships the goods out of State. Perhaps this would decrease demand for the industry. Funds collected should then be used to fund policing of illegal scrapping and building stabilization of LRA property. The license fees should be hefty and just like we do with stained glass windows, EVERY brick load should be well documented where the brick came from and some sign-off document from the owner/bank/etc of that property. Come on Mayor Slay! You can make a big difference if you would just start to look out for the common person instead of criminal businesses. After 4 years of implosion , there is finally something being done. There are no buildings left to rustle. The area of Grand , Natural Bridge , N , Florissant and Cass now looks like it can be in a war movie. How is that Clemens project coming along? Today a brick thief made off with some of our bricks and hit my wife a bit with his car making his getaway after she confronted him. The police caught the guy at 2600 University trying to sell them – she went over there and ID’d him and he was arrested. No idea what will happen now. So I guess you could say that this brickyard is open for business again. Also, have you heard anything about LRA not prosecuting people arrested for rustling their buildings? Heard that today, and, if true, that is very discouraging.